Your data will be collected on the one part by notifying Us. For example, it can be To trade data that you enter in a contact FORM. Other data is automatically collected by our IT systems when you visit the Website. These are mainly technical data (E.G. Internet browser, operating system, or time of the page call). This data will be collected automatically as soon as you enter our Website. You can disagree with this Analysis. We will inform you about the possibilities of opposition in this privacy Statement. The responsible body is the natural or legal person who, alone or together with others, has the purposes and means of processing personal data (E.G. names, e-mail Addresses O. Etc.). In the event of breaches of data protection law, the person concerned is entitled to lodge a complaint with the competent supervisory authority. The competent supervisory authority on data protection issues is the state data protection officer of the state in which our company is based. A list of data protection officers and their contact details can be found as follows: https://www.bfdi.bund.de/DE/Infothek/Anschriften_Links/anschriften_links-node.html. This site is used for security reasons and to protect the transfer of confidential content, such as orders or inquiries that you send to us as a site operator, an SSL or TLS Encryption. An encrypted connection is recognized by the fact that the Browser’s address bar changes from “http://” to “https://” and to the lock icon in your browser line. After the conclusion of a paid contract, there is an obligation to provide us with your payment details (e.g. This data is required to transmit account number at direct debit authorization). Payments via the usual means of payment (Visa/MasterCard, direct debit) are made exclusively via an encrypted SSL or TLS connection. An encrypted connection can be seen by the browser’s address line switching from “http://” to “https://” and at the lock icon in your browser line. In the case of encrypted communication, your payment data, which you submit to us, cannot be read by third parties. You have at all times the right to free information about your stored personal data, its origin and recipient and the purpose of data processing and, if applicable, a right to correction, blocking or deletion of these data. You can contact at any time, as well as to further questions on the subject of personal data at the address given in the imprint on us. Most of the cookies we use are so-called “session cookies”. They are automatically deleted after your visit. Other cookies remain stored on your device until you delete Them. These cookies enable us to recognize your browser when you next visit. Cookies that are used to carry out the electronic communication process or to provide certain functions that you wish to perform (E.G. Basket Function) are to be used on the basis of art. 6 Abs. 1 lit. F DSGVO Saved. The website operator has a legitimate interest in the storage of cookies for the technically flawless and optimized provision of its services. As far as other cookies (E.G. Cookies are stored for the analysis of your surfing behaviour), these are treated separately in this data protection Declaration. The basis for data processing is Art. 6 Abs. 1 lit. (b) DSGVO, which authorises the processing of data in order to fulfil a contract or pre-contractual Measures. The processing of the data entered in the contact form is therefore exclusively based on your consent (art. 6 Abs. 1 lit. A DSGVO). You can revoke this consent at any Time. An informal message will be sent to us by E-mail. The legality of the data processing operations until the withdrawal is not affected by the Revocation. The data you enter in the contact form will remain with us until you ask us to delete, revoke your consent to the storage or the purpose for data storage is omitted (E.G. After your request has been processed). Mandatory statutory provisions – in particular retention periods – remain Unaffected. In addition to your comment, the comment function on this page also provides information about the time of the comment, your e-mail address and, if you do not post anonymously, the username you have chosen. Our comment feature stores the IP addresses of users who write comments. Since we do not check comments on our site before unlocking, we need this data in order to be able to take action against the author in the event of violations of the law such as insults or propaganda. The comments and the related data (e.g. IP address) will be stored and remain on our website until the annotated content has been completely deleted or the comments need to be deleted for legal reasons (e.g. Offensive comments). The comments are stored on the basis of your consent (type. 6 Abs. 1 lit. A DSGVO). You can revoke any consent you give at any time. An informal message will be sent to us by E-mail. The legality of the data processing operations that have already taken place remains unaffected by the revocation. The content on our pages can be shared in compliance with data protection on social networks such as Facebook, Twitter or Google +. 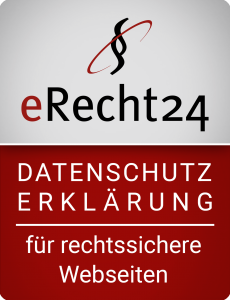 This page uses the eRecht24 Safe Sharing Tool. This tool does not establish direct contact between the networks and users until the user actively clicks on one of these buttons. This tool does not automatically transfer user data to the operators of these platforms. If the user is logged into one of the social networks, the user will appear when using the social buttons of Facebook, Google+1, Twitter & Co. An information window where the user can confirm the text before sending it. Our users can share the contents of this page in compliance with data protection on social networks without the complete browsing profiles being created by the operators of the networks. This website uses features of the Google Analytics Web analysis service. Provider is the Google inc., 1600 Amphitheatre parkway, Mountain view, CA 94043, Usa. Google Analytics uses so-called “cookies.” These are text files that are stored on your computer and enable analysis of your use of the website by you. The information generated by the cookie about your use of this Web site are usually transmitted to a server of Google in the United States and stored there. Google Analytics cookies are stored on the basis of nature. 6 Abs. 1 lit. F DSGVO. The website operator has a legitimate interest in analyzing the user behaviour in order to optimize both his web offer and his advertising. We have enabled IP anonymization on this website. This will reduce your IP address by Google within Member States of the European Union or in other Contracting States to the Agreement on the European Economic Area prior to transmission to the US. Only in exceptional cases, the full IP address to a server of Google in the USA is transferred and cut there. On behalf of the operator of this website, Google will use this information to evaluate your use of the website, to compile reports about the website activities and to provide further services related to website activity and Internet usage for website operators. It is not merged into IP address sent as part of Google Analytics from your browser with other data of Google. You can prevent the storage of cookies by adjusting your browser software; We point out however, that you fully can use if necessary, not all functions of this website in this case. You can also capture data (incl. tax) generated by the cookie and your use of the site Prevent Google from processing your IP address) and Google from processing this data by downloading and installing the browser plugin available from the following link: https://tools.google.com/dlpage/gaoptout?hl=de. Our website uses plugins of Google-powered YouTube page. Operator of this website is YouTube, LLC, 901 cherry Ave., San Bruno, CA 94066, United States. When you visit any of our sites equipped with a YouTube plugin, connect to the servers of YouTube is made. Here is the YouTube server which informed our pages you have visited. If you are logged into your YouTube account, you can allow YouTube to assign your browsing behavior directly to your personal profile. You can prevent this by you log out from your YouTube account. The use of YouTube is in the interest of an appealing presentation of our online offers. This constitutes a legitimate interest in the sense of art. 6 Abs. 1 lit. F DSGVO. The use of Google Maps is in the interest of an appealing presentation of our online offers and the easy findability of the places we have indicated on the Website. This constitutes a legitimate interest in the sense of art. 6 Abs. 1 lit. F DSGVO.